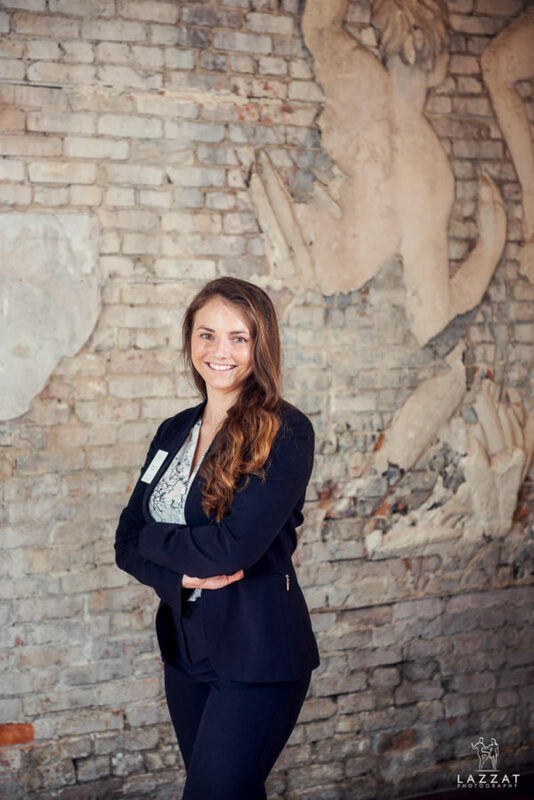 This week on Lazzat Photography Vendor Spotlight we had the pleasure of speaking with Samm from 5 Eleven Palafox! Check out the video below to learn all about this beautiful venue! (Lazzat) For our next Vendor Spotlight interview allow me to introduce you to Samm with 5Eleven. Samm, tell us a little bit about the venue. How did it all start? (Samm) 5Eleven has been a venue for about 15 years. 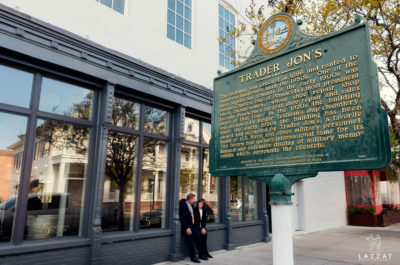 Originally it was Trader Jon’s which any Pensacola native would know Trader Jon’s. It was a native bar for all the native people. And as soon as it was done being the bar, it turned into an event space for downtown Pensacola. That’s awesome! Hence it explains this very interesting and intricate art on the wall which was one of the unique features of this venue. Do we know the story behind it? I’ve heard a couple of different things. I’ve heard that it was put up right after Trader Jon’s. I’ve heard that there is some Greek mythology behind it. I’m not really sure which one is correct, but it is a great conversation starter, especially at a wedding during the cocktail hour or during a reception. People absolutely love! And do couples put their sweetheart table right underneath it? Not right here. A lot of people will definitely do it right next to the wall and they make gorgeous photos and gorgeous video, but most people do their dance floor right over here. It’s like a backdrop to the dance floor. Oh, that would be an amazing backdrop! Tell us a little bit about how many people does the venue accommodate? Do you offer packages? If I am a bride who has never shopped for a wedding venue I wouldn’t know where to start. How do we go about it? We can hold up to 300 people with the use of our side lawn. Inside it can hold up to 150 people seated and then we can do the ceremony in the courtyard, we can do a cocktail hour in the courtyard, we can do ceremony or cocktail hour or dinner and dance out in the side lawn. There is no set layout. You can readily utilize any of these spaces for whatever you like. We do have all-inclusive pricing. We just got a caterer and bartender for an in-house, so we can do all through 5Eleven or you can branch out and get a couple of other vendors as well. It’s an all-inclusive pricing that includes furniture, space, and everything. So what else does it include? The original price is inside and the courtyard and you can add the side lawn. For smaller parties, you don’t have to add the side lawn. We typically have 75 to 150 guest count and then for those larger parties, you can use the side lawn if you want to. As for furniture, we have chairs and tables, our AV system which is our projector screen and speakers inside the courtyard and two wireless microphones. That’s amazing! What about the price range? Hours Saturdays have the highest price range, Fridays and Sundays are a bit lower, and during the week it’s an hourly price. If a bride is shopping for a venue how much should she anticipate spending for a prime day, Saturday? $3,000. That’s all-inclusive, so building, courtyard and have the side lawn if needed, all furniture is included. It’s 9 a.m. to 11 p.m. rental, which is 14 hours total, a ton of time to set up, party, get married, and then break it all down at the end of the night. It’s not an hourly charge on a weekend. What about a Bridal Suite and Groom’s Room? Do you have all of those and are they included in the price? We are excited to say that we’re putting a brand new Bridal Suite upstairs, and that should be done by the end of 2018 for the Bridal Suite. Grooms still have to get ready and kind of hang out offsite. 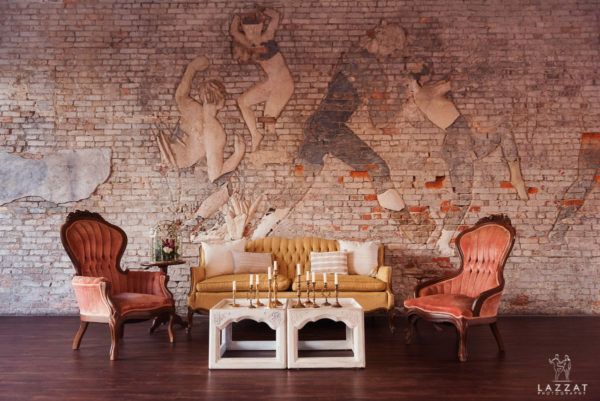 We are looking into different Groom’s Room options, but it would still be offsite at one of our other venues. But we’re very excited about the Bridal Suite upstairs. It should be around 100 sq.ft. with a bathroom and the kitchenette for mimosas and food, plenty of outlets and lights and everything to do hair and makeup. You mentioned you have an in-house catering and bartending services. Are DJ Services included? No DJ Services. We do have an AV system with an aux cord and speakers in the courtyard, and that way you can be your own DJ. But some people like to have a DJ to MC the night. I always tell my couples when you are planning a wedding one of your things to remember is that the guests are going to remember how much fun they had and that’s based on how good of a DJ you are going to hire. So connecting with the DJ on a very personal level, who becomes familiar with your personality and throws the best party ever and that’s what the guests are going to remember. And how good the food was. If guests are hungry, they are going to remember that as well. Can couples bring their own vendors like their own catering company? Is there an additional charge for that? We actually do not allow bringing your own catering company, but we have 11 caterers to choose from. So there are a ton of options, anywhere from barbecue to fine-dining to a plated dinner to a taco bar. A lot of options to choose from. What about the open bar service? I know you mentioned you are offering the bartender services. How does that work? We just started this new bar venture. We’re super excited and it’s super new. You can do a full open bar or a cash bar, you can do 2-hr open bar for the cocktail hour and cash bar for the rest of the night. There are unlimited options when it comes to drinks. We have signature drinks beer, wine, alcohol all in this package. We’re trying to make it a One Stop Shop all-inclusive pricing just at 5Eleven, or you can get one of those caterers to bartend as well. I see that 5Eleven is trying to streamline all processes to make wedding planning as easy for the couples as possible. It’s amazing to see the value it brings to the couples and I am sure they appreciate when you offer an all-inclusive option that is newly available at 5Eleven. Any fun fact about your venue? As this used to be Trader Jon’s, we get a lot of Pensacola natives, especially parents, that come and say “I used to come here all the time. This used to be a Trader Jon’s.” It has so much history. This chandelier over here as well has been here since forever as well. This used to be also a chandelier shop as well as a shoe shop so it’s changed many hats. Just the history alone is pretty special for the venue. That’s great. What new exciting things that are happening at 5Eleven in the upcoming months? I know you mentioned you are bringing a brand new Bridal Suite. Is there anything else that’s happening? We’re still looking at Grooms options. We have to put them somewhere. And right now they’re staying at hotels or Airbnb and just come in when it’s time to get married. We are also looking into getting different rental pieces in terms of different lanterns, centerpieces, and things like that to rent out, different furniture pieces to rent out for outdoor events. 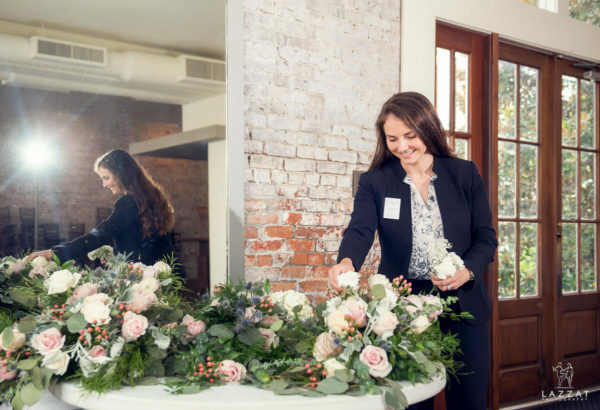 And then I would say our other really exciting things are our all-inclusive super easy process where you can have other spaces in downtown to do rehearsal dinners, bachelor and bachelorette parties. We can take care of every single part of your wedding planning with different venue options we offer. 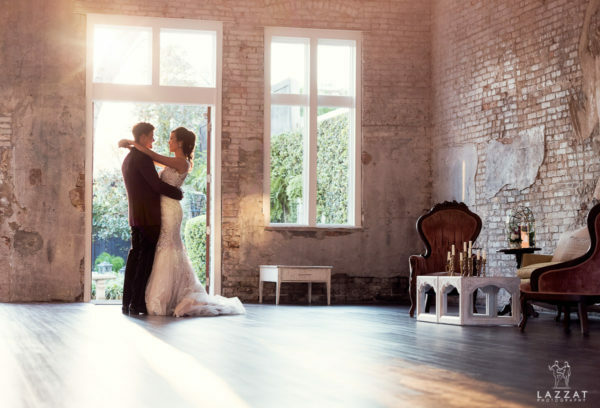 Do you have any advice for a bride who is looking for a perfect wedding venue? That’s a great question. I would say either look definitely for all-inclusive or to lay out all the pricing up front so you know exactly what you are getting into and then look for something that you can turn into your own. There’a been a thousand weddings here before. And there is always a bride that makes it look very different. You don’t have to have a blush color theme to match the wall. I’ve seen purples, navy blue colors. I would say, look for space that can really fit your budget and your vision and don’t just look at the photos that everybody else has done here before. Speaking of decorations here at the venue, is there any one of them that stands out and very unique? Do you have any funny stories from past events? Once we had to move a wedding from outside to inside because of the rain and made it work. You can tent the courtyard, but only a couple of tents because of the tree so you can’t tent the whole thing but the couple was just great to work with, so it was easy to do. Some people say it’s haunted but as far as I know, it’s not haunted. It’s so great to work with so many different types of people. Each couple has its own story to tell as you may know. Usually, when couples don’t hire a wedding planner and if there is no wedding coordinator at the venue, as a photographer I help them create their wedding timeline and explain how long certain things take and how much time it takes to photograph a large or small bridal party, or when to photograph family portraits. Do you offer clean-up services? Our caterers actually clean, they take the trash with them, we have a very limited availability here on site, we don’t have a dumpster here. They follow all policies and procedures and that’s why they are one of our caterers. We have their insurance so couples don’t have to get their own insurance. It’s all through us so it really makes it that much easier. Is the cleanup included in the catering price? For some caterers yes, and for some caterers no. It just depends on which one they go with. Samm, tell us how our brides can find you. Thank you so much for sharing all those stories about your venue and taking time from your busy schedule. I really appreciate it and look forward to working with you all of the future weddings. I’m really excited about the new things that are happening at 5Eleven and I can not wait to see the Bridal Suite! Thank you so much for having me. We are very excited for the Bridal Suite and I appreciate you being here and sharing our story. Thank you! We have also had the pleasure of doing a styled wedding shoot at this venue, check it out here! Thank you again to Samm from 5 Eleven Palafox and Kevin from Rising Sun Video Productions for making this interview possible! Do you offer clean up services? Thank you again to Samm from 5 Eleven Palafox and Kevin from Rising Sun Video Productions for making this possible!